Frequent Smooth Sow Thistle were noted on the Pixie Path and a few small Marmalade Flies (a common hoverfly),Episyrphus balteatus, settled on the yellow flowers. 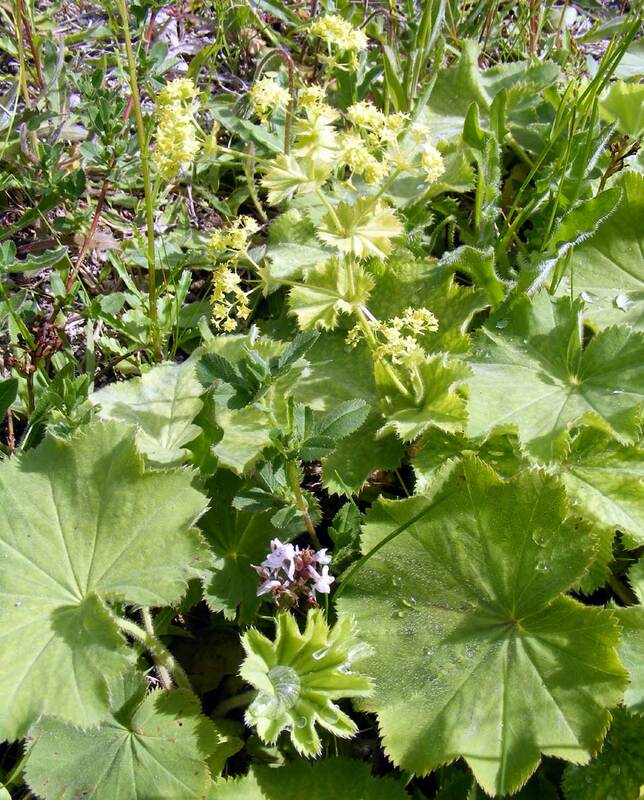 At the top of the Pixie Path, two Spear Thistle flowers were noted, as well as a handful of Ploughman's Spikenard plants with their small yellow flowers. 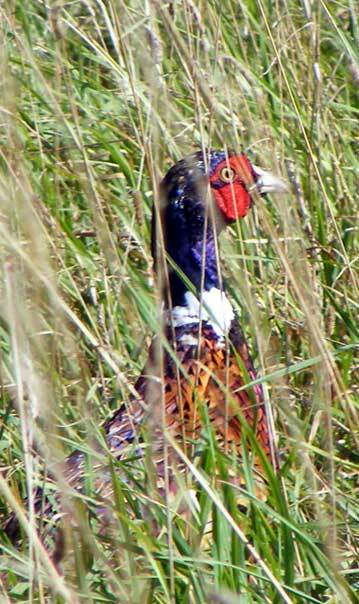 In amongst the long grass of Frampton's Field, a male Pheasant trotted. And on the Pixie Path there was an adult Slow Worm lying dead. There were brief snatches of sunshine through the gaps in the clouds (>18.7 °C): the approaches to Mill Hill (Waterworks Road - Pixie Path) yielded my first Common Lizards, Lacerta vivipara, of the year. Butterflies included a probable Green-veined White, at least one Speckled Wood, a worn Peacock (NW corner of Frampton's Field), a Comma (entrance to the Mill Hill Cutting, SW), few Large Whites and about a dozen Red Admirals (mostly on the Ivy at the top part of the Pixie Path). There was a colony of Yellow Meadow Ants (also known as Red Ants) Lasius flavus, under a wooden plank on the Mill Hill Cutting, SW.
On a pleasant day (>17.2 °C), the outskirts of Shoreham (Waterworks Road - Pixie Path - Chanctonbury Drive, passage trek) hosted the following butterflies: nine Speckled Woods, about a dozen Red Admirals (mostly on the Ivy in the NW part of the Pixie Path), a handful of Large Whites, a Holly Blue (entrance to the Mill Hill Cutting, SW) a worn Peacock (NW corner of Frampton's Field) and a Small White. A handful of Common Darters (dragonfly) flew rapidly overhead with none of them showing any signs of settling. An appreciable breeze (Force 5 gusting to 6) made conditions inimical to watching butterflies on a cloudy, nearly warm (> 19.1 °C) day. Over the vegetation at the top of Chanctonbury Drive, north Shoreham, two Large White Butterflies were noted and a Speckled Wood amongst the greenery. Ivy attracted the bees and the butterflies (especially on the Ivy on the Pixie Path near the north-west corner of Frampton's Field) notably 10 Red Admirals, two Comma Butterflies and two Speckled Woods. On Mill Hill Cutting (SW) there were three more good condition Red Admirals and unidentified large bright blue butterfly which was thought to be another male Adonis Blue (later thought to be a Holly Blue) in an area where Adonis Blues have not been recorded before. On a warm sticky day, I made a brief visit to Mill Hill Cutting (SW) from the Waterworks Road direction seeing on-route occasional Large Whites, one Comma Butterfly, a few Meadow Browns, frequent Gatekeepers. On arrival I immediately counted 15 male Chalkhill Blues all in flight at the same time and two females within a couple of minutes. The Chalkhill Blues were all very lively and did not seem to find nectar plants to visit although they had a look at Eyebrights. On the way home I made a quick detour down the Pixie Path where I added a Red Admiral and a Holly Blue to the butterfly list. On the Mill Hill Cutting (SW) there were over twenty lively Chalkhill Blues including at least one female. 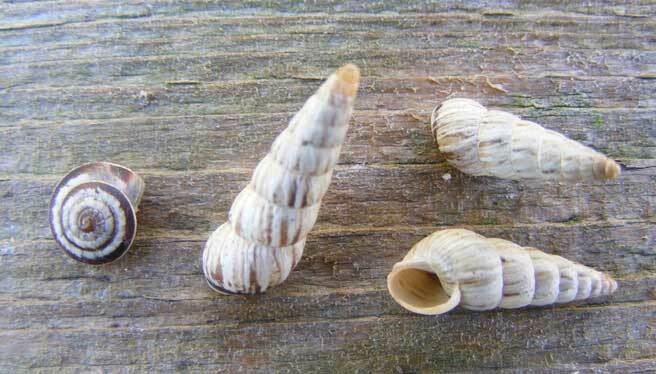 All of these appeared very fresh and could have recently emerged. 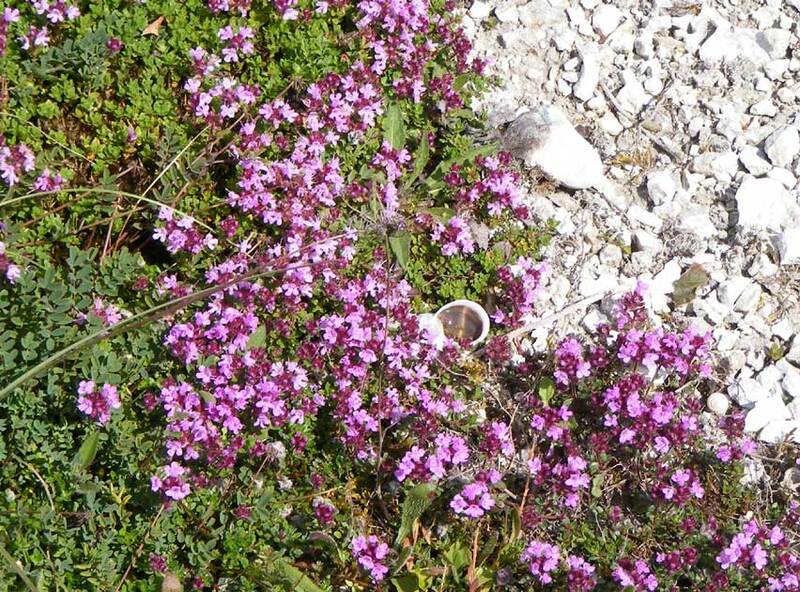 They visited Bird's Foot Trefoil and Eyebright and all were very flighty. 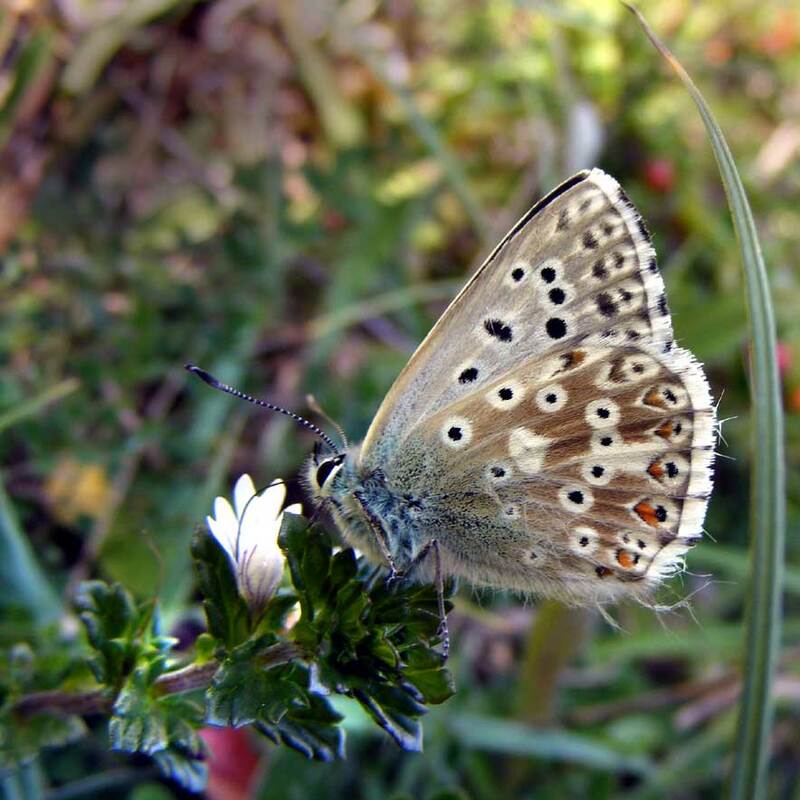 There was a male Chalkhill Blue visiting Greater Knapweed in the north-west corner of Frampton's Field. Speckled Woods were courting at the top of Chanctonbury Drive. On the Pixie Path I spotted my first Migrant Hawker (dragonfly) of the year. There was also at least two Common Darters, and two Hornet Robber Flies, Asilus crabroniformis, on the Chestnut fencing. By the time I arrived at the Mill Hill Cutting (SW) it was decidedly cool, and no butterflies were in flight. On a small clump of Horseshoe Vetch, Hippocrepis comosa, leaves, three male Chalkhill Blues fitted in the camera lens with their wings open, but they all flew off before I could press the shutter. A Six-spotted Burnet Moth rested on a Greater Knapweed flower. As I felt a slight warmth on my back as the sun shone through a gap in the clouds, I spotted my first butterfly of the day, a Speckled Wood on a piece of white paper at the top of Mill Hill Drive at the entrance of the linear copse on the west side of the road before the bridge. The meadowed southern bank of the Slonk Hill Cutting failed to reveal any Ringlet Butterflies, just nine Meadow Browns and my only Marbled White of the day. The area next to the path when the copse opened up added two Large Whites and a Small White Butterfly. There was also a Volucella inanis hoverfly. The southern part of Buckingham Cutting and its surrounds failed to add any Small Blues, but there were three Green-veined Whites, some Large Whites, two more Speckled Woods and two Holly Blues. The Pyramidal Orchid was almost finished but there was some Kidney Vetch still in flower and a large clump of Marjoram next to the road. 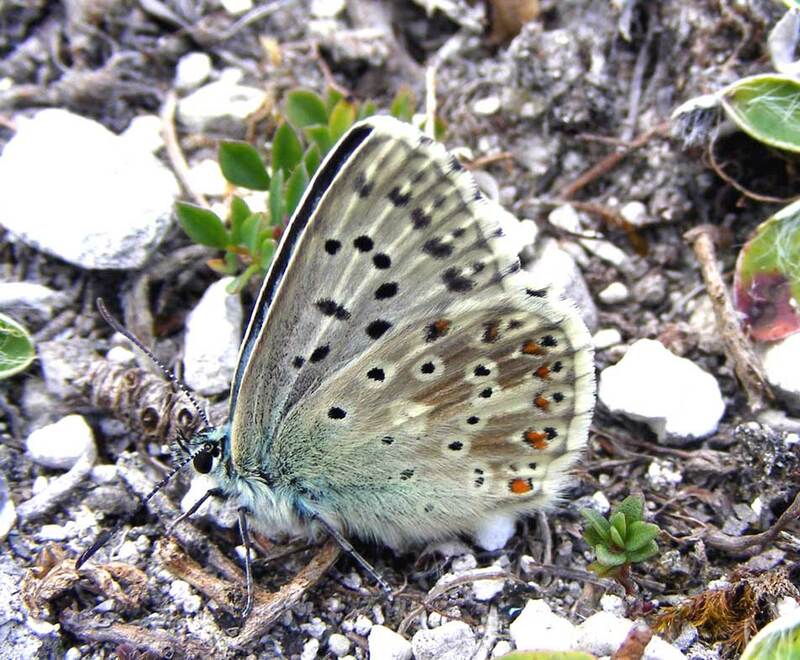 It was decidedly cool and breezy by the time I cycled down the A27 to the south-west part of the MIll Hill Cutting where I immediately disturbed a male Chalkhill Blue Butterfly as I left the road. It was one of four males which were too lively to photograph except for one that settled with its wings closed. I recorded my first female Chalkhill Blue of the year visiting a Bird's Foot Trefoil flower, where there was also a female Common Blue amongst the Horseshoe Vetch, Hippocrepis comosa, leaves. Another Meadow Brown was noted and a dead Slow Worm. On the Pixie Path I spotted my first Common Darter (dragonfly) of the year, two more Speckled Woods, my first Gatekeeper of the day, another Meadow Brown and two more Holly Blues at the top around the hedge near the bridge. At the top of Chanctonbury Drive, I added five more Speckled Woods. A blue sky but a rather cool day for July, 19.2 °C at midday: so this meant the blue butterflies were not actively flying, although there were frequent Large White Butterflies over Shoreham town with the first Meadow Brown in Park Drive, and the first of the frequent Speckled Woods at the top of Buckingham Park. Around the Buckingham Cutting (south) there were a few Red Admirals and Holly Blues amongst the Brambles, and a few Six-spotted Burnet Moths and at least one Silver Y Moth on the roadside meadow. 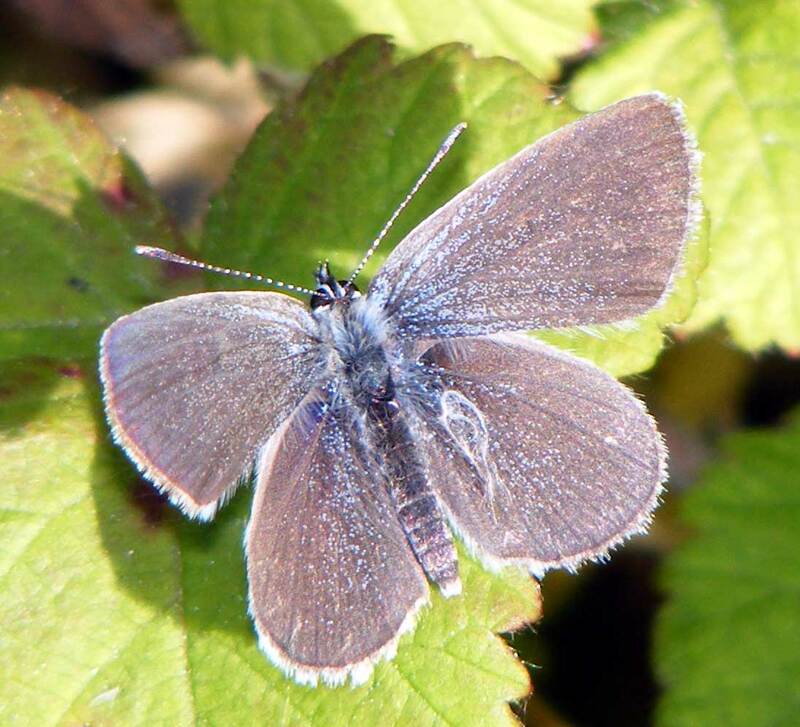 The first male Chalkhill Blue was disturbed on the south-western bank of Mill Hill Cutting. It flew over the Brambles and nearly got sucked into the slipstream of the passing traffic. Gatekeepers were everywhere there were Brambles. A Carpet Moth landed on a Bramble leaf. 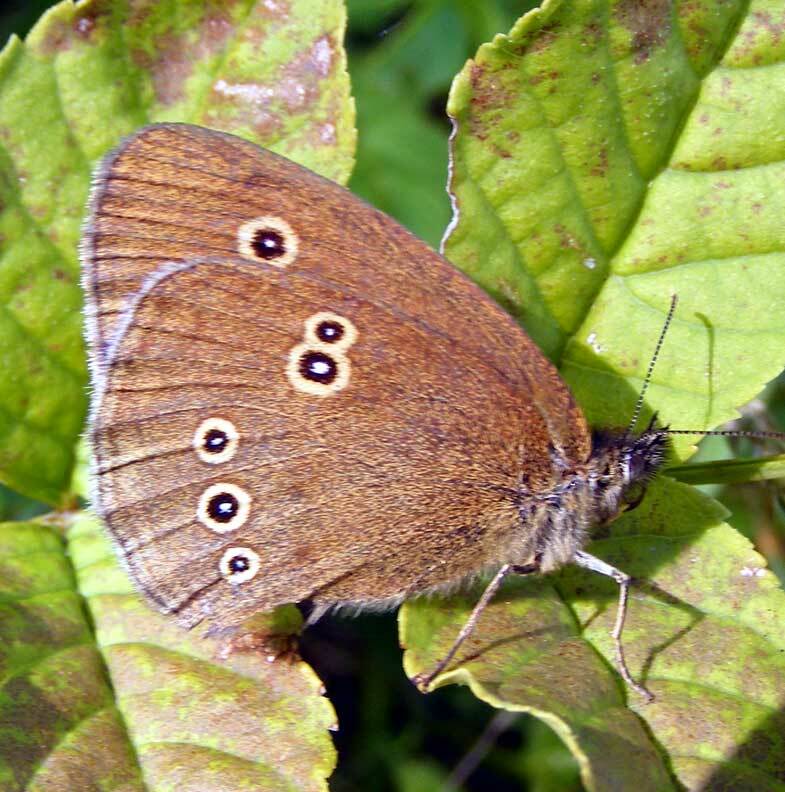 At least three Ringlet Butterflies in the meadow on the southern bank of the Slonk Hill Cutting were rather belated first of year additions for this species. They were amongst Meadow Browns and I had to follow them until they settled to make sure. There were also a few Silver Y Moths. 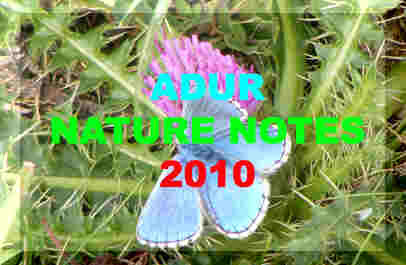 Large Whites occurred and were frequent in Shoreham town. Other butterflies on the meadow were one Marbled White and in the linear copse there were occasional Speckled Woods. On the southern meadow bank of the Buckingham Cutting, I encountered a bright blue butterfly fluttering from one flower to another especially the Melilot and when settled this was discovered to be a Holly Blue. 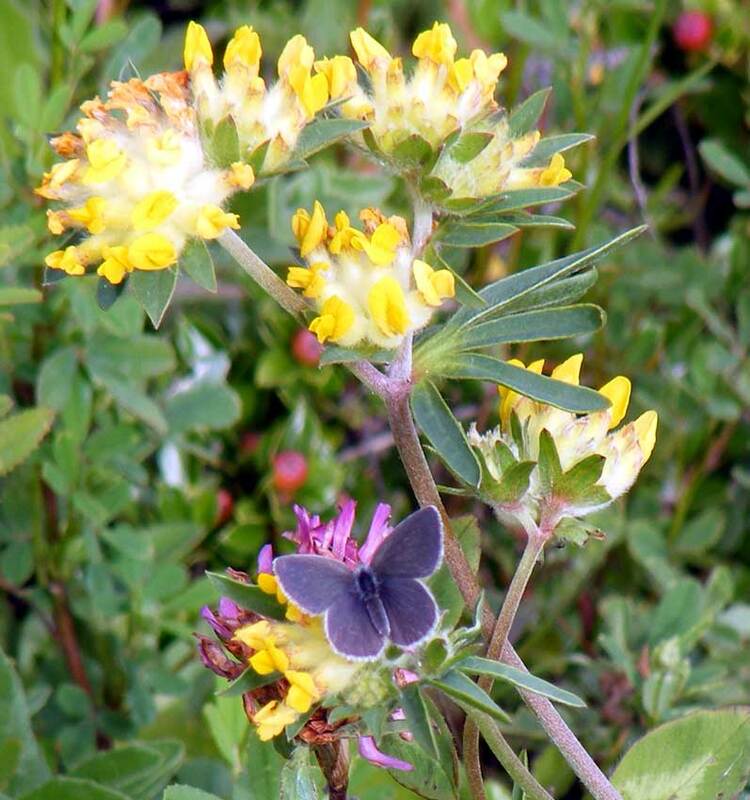 After a few minutes I finally noticed a single Small Blue on a Kidney Vetch. I disturbed two Red Admirals in the hedgerow. On a hot and humid morning, I noticed the first Humming-bird Hawkmoth of the year flying energetically around the vegetation at the top of Chanctonbury Drive, north Shoreham. On an overcast day, the sun shone briefly and the breeze was still a Force 5. Predictably butterflies were hiding. On the southern bank of the Slonk Hill Cutting the first appearance on the roadside meadow was a Marbled White followed by five Meadow Browns and a Yellow Shell Moth. On the Buckingham Cutting (south) a Small White was clearly seen with at least seven Small Blues in breezy conditions. On the Mill Hill Cutting, a pristine Comma Butterfly put in an instant appearance, followed by two Common Blues and two Meadow Browns. 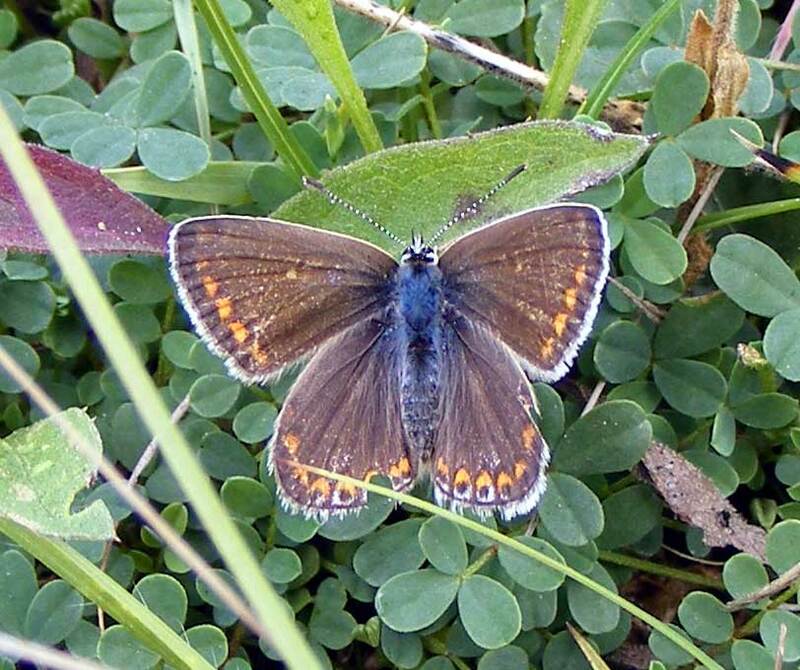 One definite Small Blue Butterfly landed amongst the mix of Wild Thyme and Horseshoe Vetch leaves. 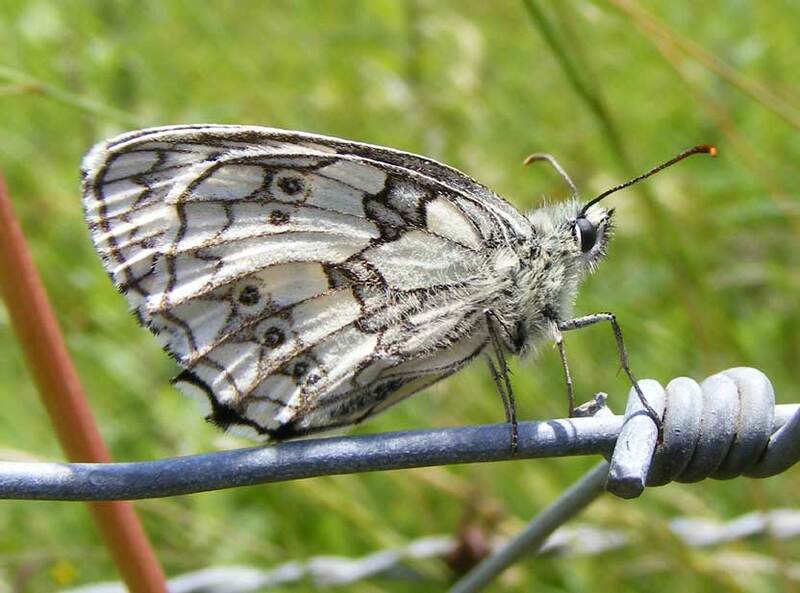 The Pixie Path was exceptionally breezy and a Marbled White was blown rather than fluttering about and last seen resting with its wings closed on the barbed wire fence. A pyralid moth Pyrausta despicata landed on the path and another Yellow Shell Moth flitted into the vegetation. There was also two Meadow Browns over Frampton's Field. When will the wind die down? It was blowing Force 6 (gusting to Force 8) from the WSW and it was much too blowy for Mill Hill or any butterflies in town, although I did spot a Small Blue on the southern bank of the Buckingham Cutting. 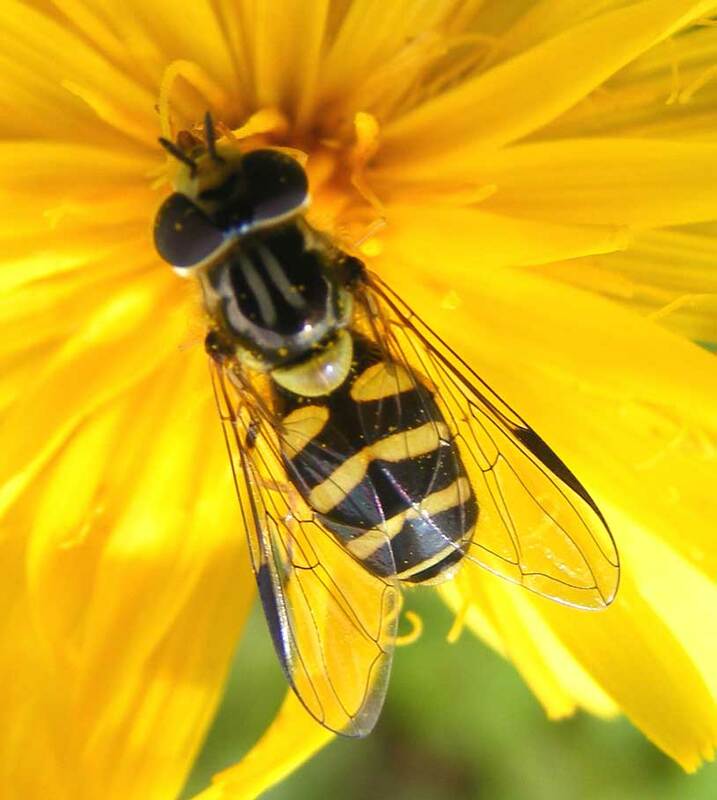 This hoverfly was seen on Buckingham Cutting (south) in Force 6 breezy conditions. Just when I was thinking it was too windy (Force 4) for butterflies a pristine Red Admiral landed on a Bramble leaf at head height in front of me along the edge of the overgrown path on the south side of the Slonk Hill Cutting. Almost immediately a pristine Large White Butterfly landed on a flower. 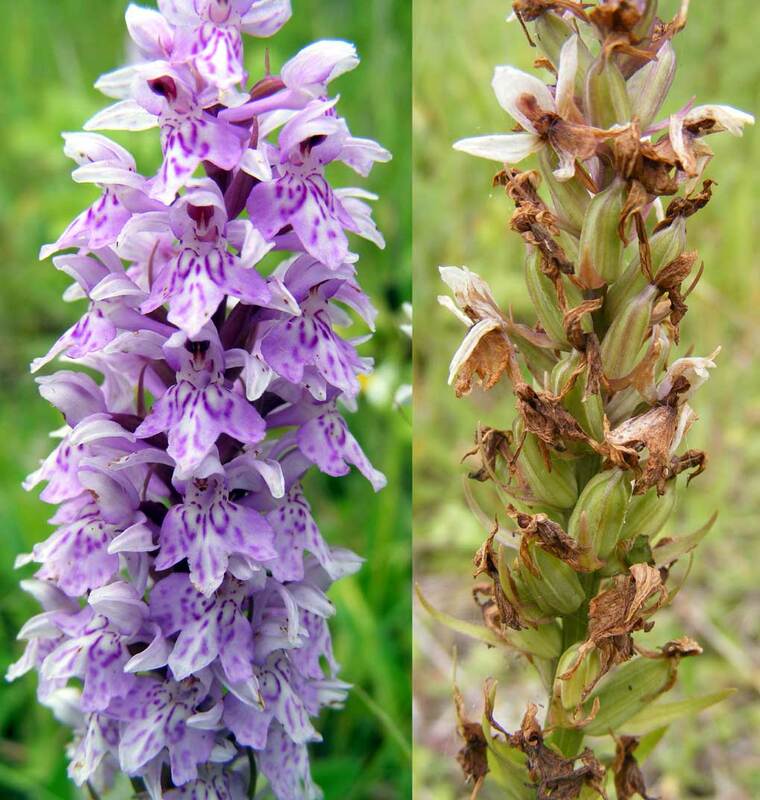 There were no butterflies on the open meadow (Spotted Orchid section) on the eastern part of the cutting. A few minutes later a Large Skipper fluttered away on the central overgrown part where the Brambles were less. And a few minutes after that an older Red Admiral fluttered or was blown by. I discovered a large Black Ants nest under a discarded road sign. 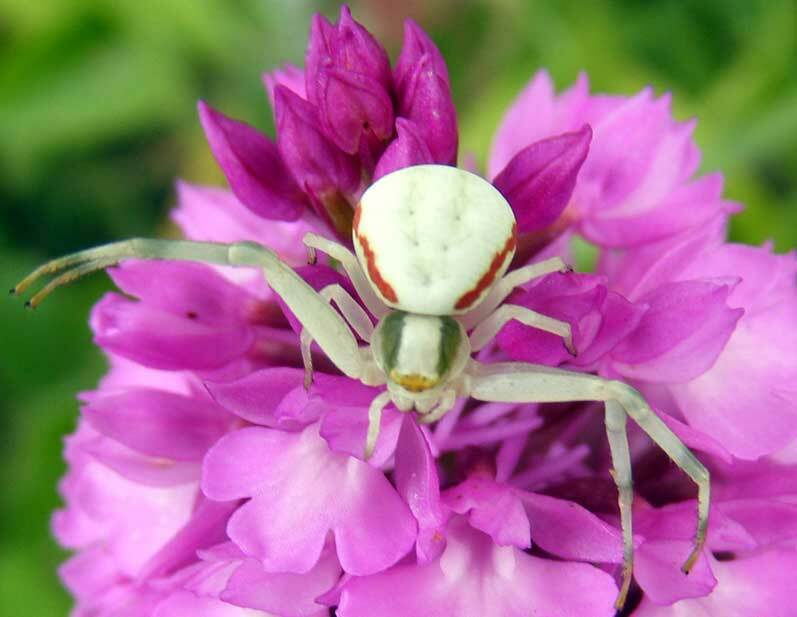 It was next to this that a small white crab spider Misumena vatia was waiting in ambush on a purple Pyramidal Orchid. 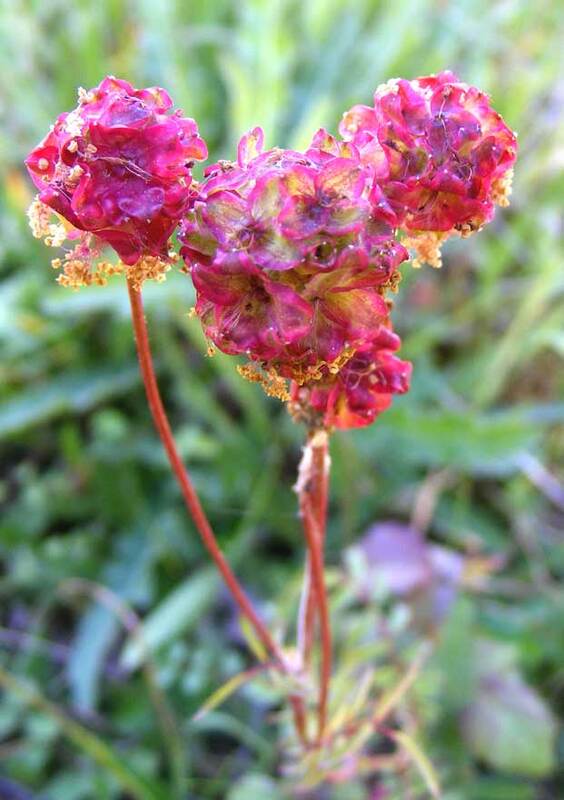 Still buffeted by the Moderate Breeze about thirty Small Blue Butterflies flitted amongst the Kidney Vetch and the more sheltered Brambles on the southern side of the Buckingham Cutting, where the Pyramidal Orchids were flowering and the Horseshoe Vetch had disappeared. Beetles noted were small green beetles Cryptocephalus and small black pollen beetles Meligethes, the Thick-legged Flower Beetle Oedemera nobilis, and the brown species Lagria hirta. It was warm and blustery, the warmest day of the year so far recorded at 25.8 °C at 3:00 pm, but again spoilt by steady Strong Breeze (Force 6) from the north-east gusting to Gale Force 7 all through the day. Two bluish-green Hawker dragonflies were seen sparring at the top of Chanctonbury Drive, north Shoreham (SE of Mill Hill), but they flew upwards over house height against the wind before I could get a closer look. 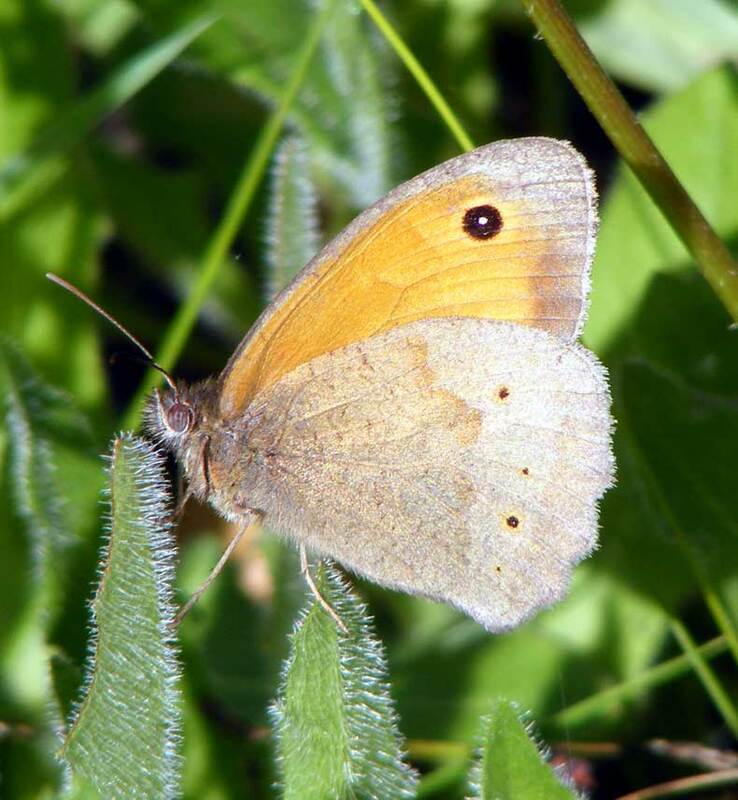 Butterflies were mostly in hiding, but six species were seen on the outskirts of Shoreham. Twelve Small Blue Butterflies were all to be found sheltered amongst the Brambles, with two male Common Blues, and one Red Admiral. There was a Large White at the top of The Drive, north Shoreham. It was an almost perfect blue sky with a few streaks of wispy Cirrus clouds and a pleasant 23.5 °C which was the the warmest day of the year so far, spoilt by steady Strong Breeze (Force 6) gusting to Gale Force 7 in the afternoon. The strong wind made it unpleasant to be out in the open and the and thirty plus Small Blue Butterflies were all to be found sheltered amongst the Brambles, where I noted my first three or more Large Skippers of the year on the linear copse path of the southern side of the Slonk Hill Cutting. There were also two female Broad-bodied Chasers. The first Pyramidal Orchids were beginning to flower on the southern bank of the Buckingham Cutting, but it was too blowy (Force 5) to photograph them. On a day most noted for its cloud formations, I spotted a Speckled Wood Butterfly fluttering under the trees at the top of Buckingham Park, north Shoreham. Immediately I entered the Bramble-bordered path that opening up in the southern bank of the Buckingham Cutting, a Broad-bodied Chaser, Libellula depressa, (a dragonfly) landed, a five Small Blue Butterflies fluttered around; but it was too wind-swept on the open cutting, where I spotted a male Common Blue Butterfly on a still flowering Horseshoe Vetch, Hippocrepis comosa. 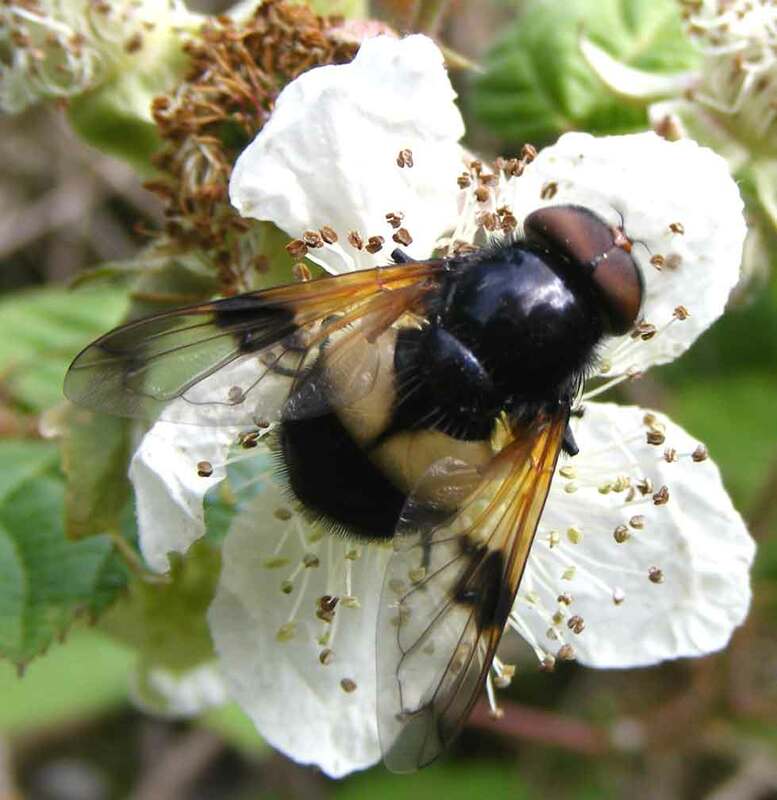 Amongst the Bramble flowers there were a few each of the bumblebees; White-tailed Bumblebees Bombus lucorum, Red-tailed Bumblebees, Bombus lapidarius, and Common Carder Bees, Bombus pascuorum; and hoverflies including a Volucella pellucens. 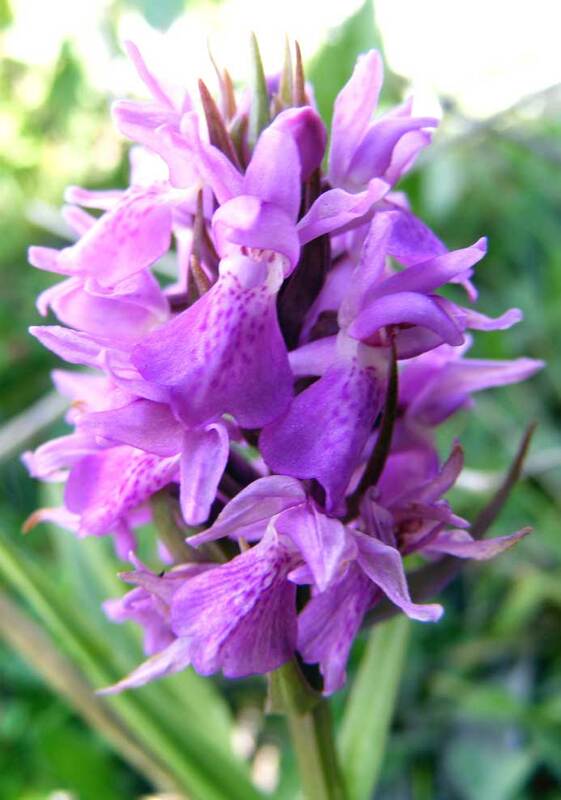 A few Southern Marsh Orchids, Dactylorhiza praetermissa, were flowering on the Mill Hill Cutting (south). A few Thick-legged Flower Beetles, Oedemera nobilis, crawled over Greater Knapweed in flower on the edge of Frampton's Field (north). The first Common Blue Damselfly of the year put in an appearance in amongst the Brambles in a shady area behind the southern bank of the Buckingham Cutting. They shared the area with three Speckled Woods, one Holly Blue and a Large White. 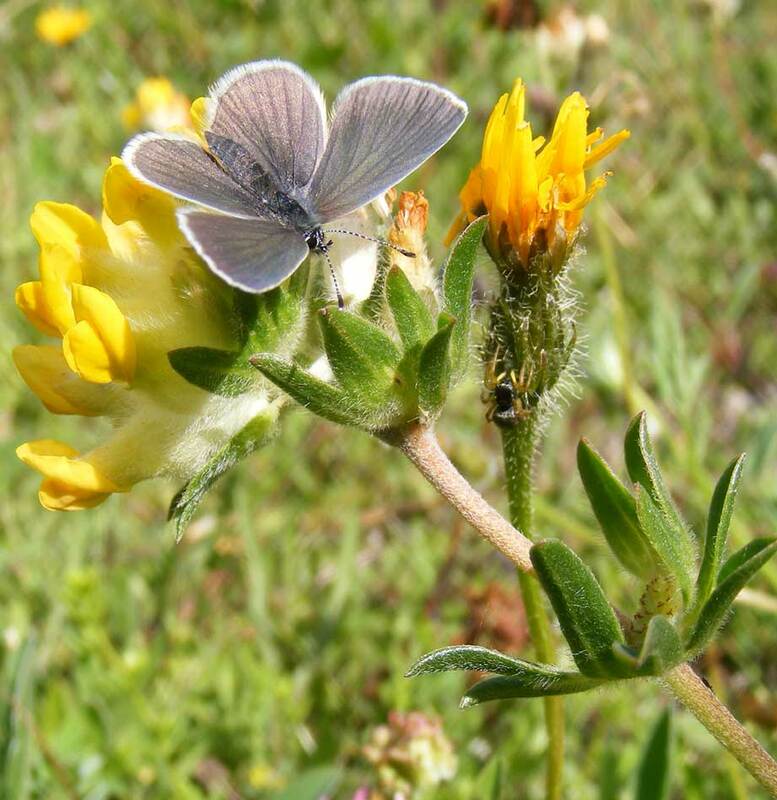 On the open bank about eight Small Blue Butterflies flitted about in the mid-afternoon sunshine with one male Common Blue Butterfly was seen visiting a still flowering Horseshoe Vetch, Hippocrepis comosa. 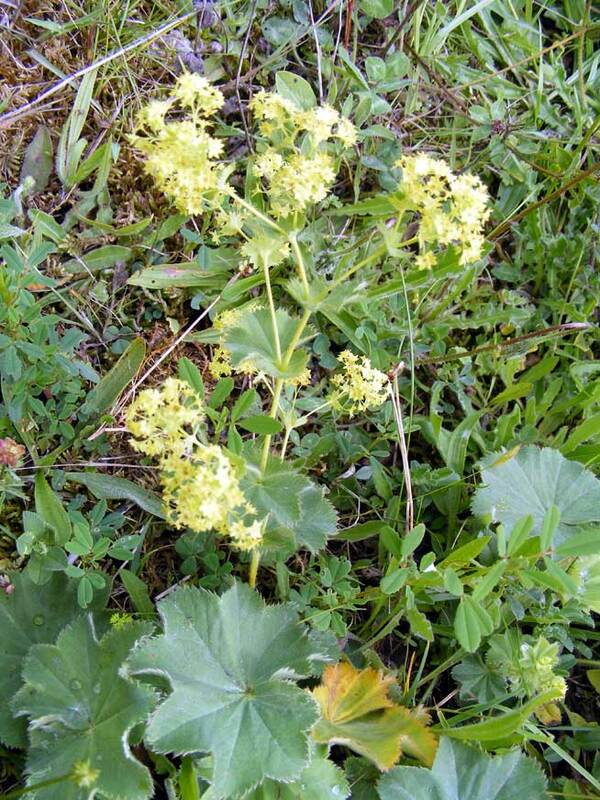 There were swathes of this herb on the north-facing southern bank of the cutting but the larger swathes on the northern bank had almost disappeared. 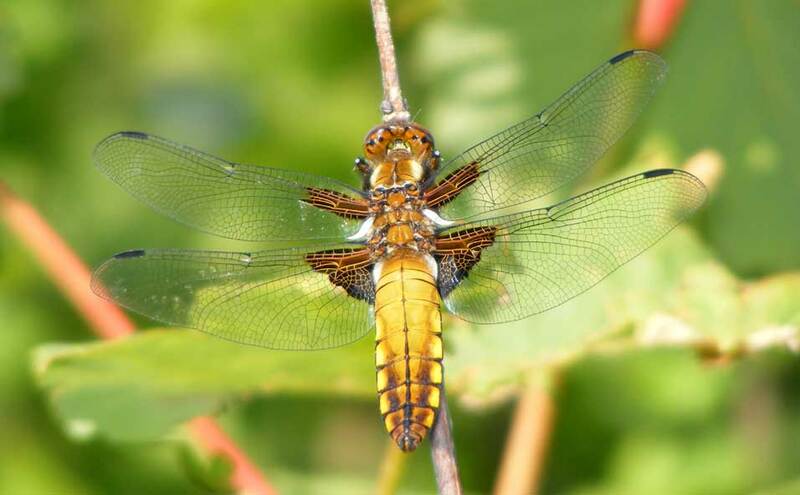 Two female Broad-bodied Chasers, Libellula depressa, (a dragonfly) cruised over an open part of the path that runs parallel with the dual carriageway at the top of the southern embankment of the the Slonk Hill Cutting. Both of them settled, one of them long enough for the photograph above. 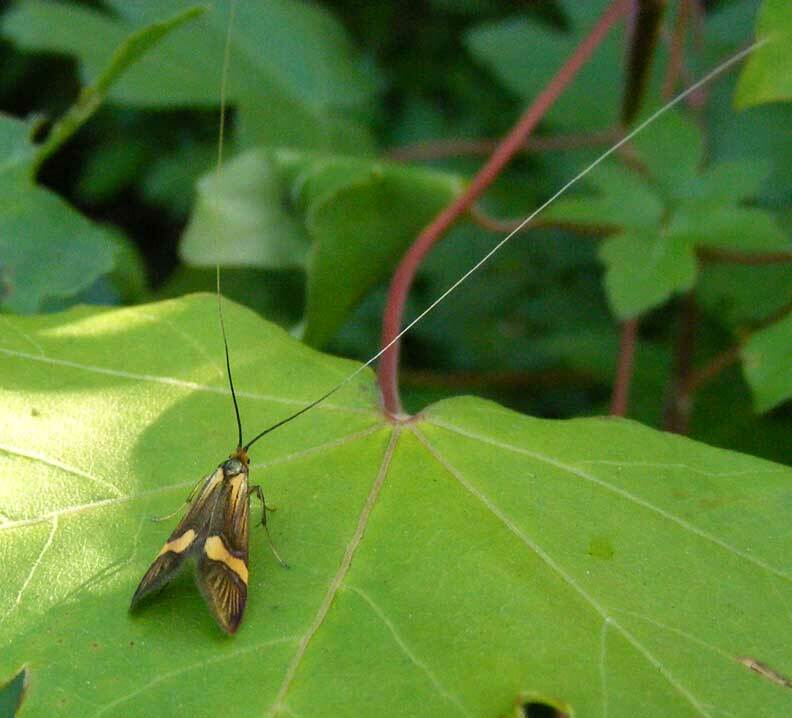 The small moth with long antennae was Nemophora degeerella. The green beetle seems to be Cryptocephalus aureolus. 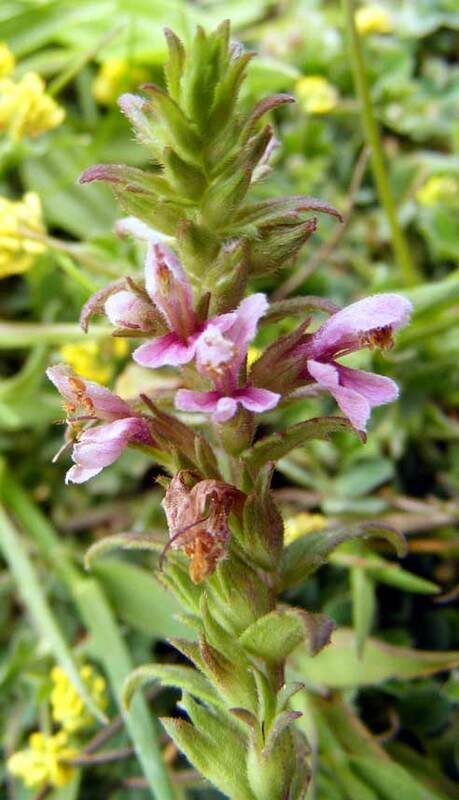 It was frequently seen on Kidney Vetch, Buttercups and Mouse-eared Hawkweed flowers. I found two roosting Small Blue Butterflies for the first time this year on the southern bank of the Buckingham Cutting and I noted the first Kidney Vetch and the first Spotted Orchids in flower this year, blown about in a blustery (Force 5). At the top of Chanctonbury Drive (near Mill Hill) there was a Red Admiral and a Speckled Wood Butterfly. I found two roosting Small Blue Butterflies for the first time this year on the southern bank of the Buckingham Cutting and I noted the first Kidney Vetch and Spotted Orchids in flower. There was another Speckled Wood resting on a Bramble in the middle of the afternoon under a cloudy sky. There was one Wall Brown Butterfly on the Pixie Path as well as Holly Blues, Speckled Woods and Large Whites. On the edge of Frampton's Field, Old Shoreham, by the wire fence bordering the Pixie Path, Milkwort was found in large patches where the field was not grazed by horses. Horseshoe Vetch was flowering abundantly on the north side of the Slonk Hill Cutting. The young Fox appeared on the Pixie Path (south-north section, central) and immediately backtracked and disappeared down the slope. 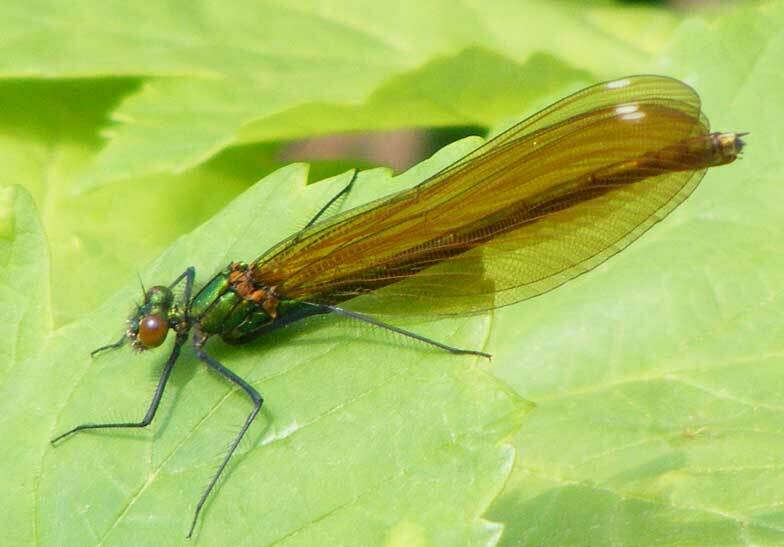 Maybe it was fitting for the morning of the Royal Wedding there was the emergence of the female Beautiful Demoiselles, Calopteryx virgo, with three seen of these damselflies on the outskirts of Shoreham. The first one was seen amongst Brambles at the top of Mill Hill Cutting (south) on the overgrown footpath, the second on the return trip at the top of the Pixie Path. On a breezy (Force 4 to 5) cool (>16.0 °C ) day, I made a quick visit to Mill Hill, via the Dovecote Estate and at the top of Chanctonbury Drive (SE of the Mill Hill Bridge), Holly Blues were mating, Speckled Woods landed on Daisies on the mown grass and an Orange-tip fluttered by. Two Large Red Damselflies settled close to each other. There was Red Admiral in the Butterfly Copse next to the Waterworks Road, Old Shoreham. Spring arrived on a sunny day (14.5 °C). 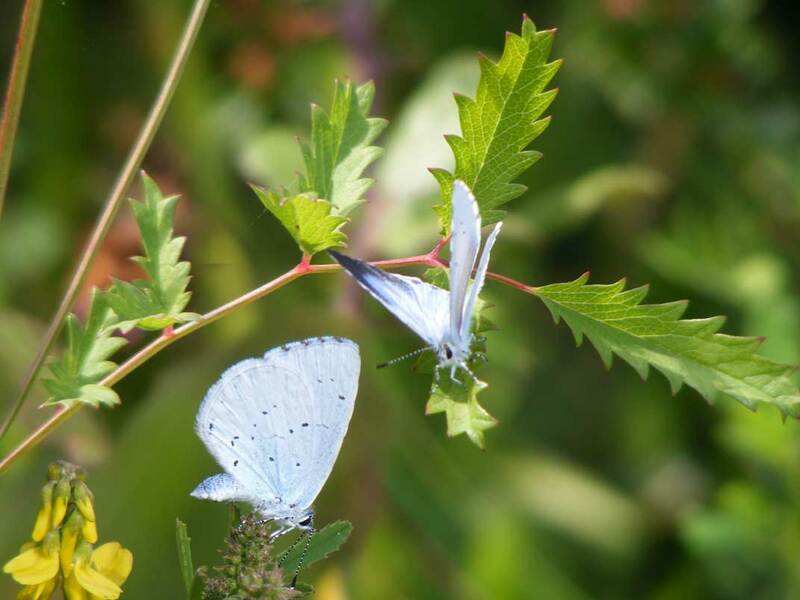 Two Small White Butterflies were seen over Hamm Road Allotments in the middle of Shoreham. The next butterflies seen were over the grass (with Dandelions and Daisies) at the top of Chanctonbury Drive, north Shoreham (Dovecote Estate, SE of the Mill Hill Bridge) where my my first Large White Butterfly of the year settled with its wings open and was easily identified, followed almost immediately by three Speckled Woods and two unexpected male Orange-tips. 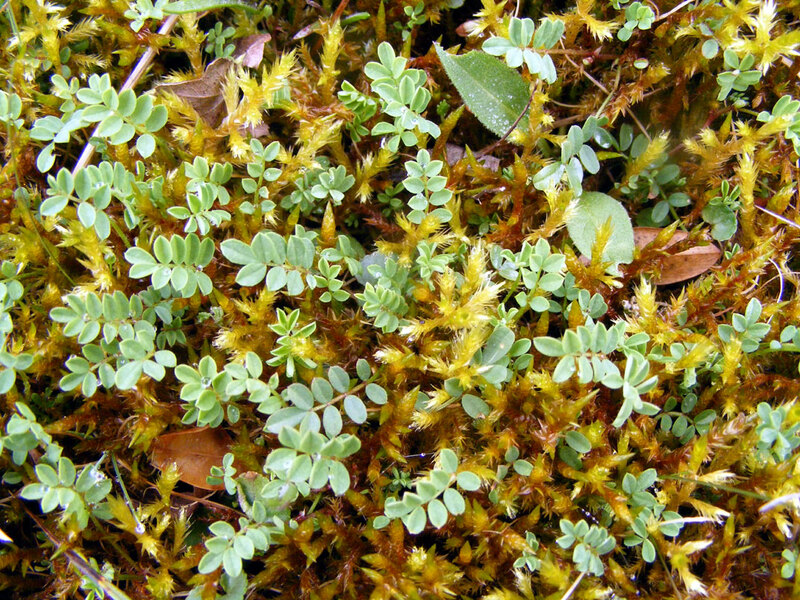 Moss and Horseshoe Vetch, Hippocrepis comosa, on the Mill Hill Cutting. I recorded my first beetle this year, the very small Paederus littoralis seen under a plastic cap on Mill Hill Cutting south, (amongst Ivy leaves next to the Pixie Path), with a slightly larger small spider of the genus Pardosa (probably). A few Holly berries were still be to be seen on the PixiePath/Mill Hill Cutting boundary. As the first rays of sunshine of the year occurred for about an hour around midday ventured to the Pixie Path near Mill Hill. 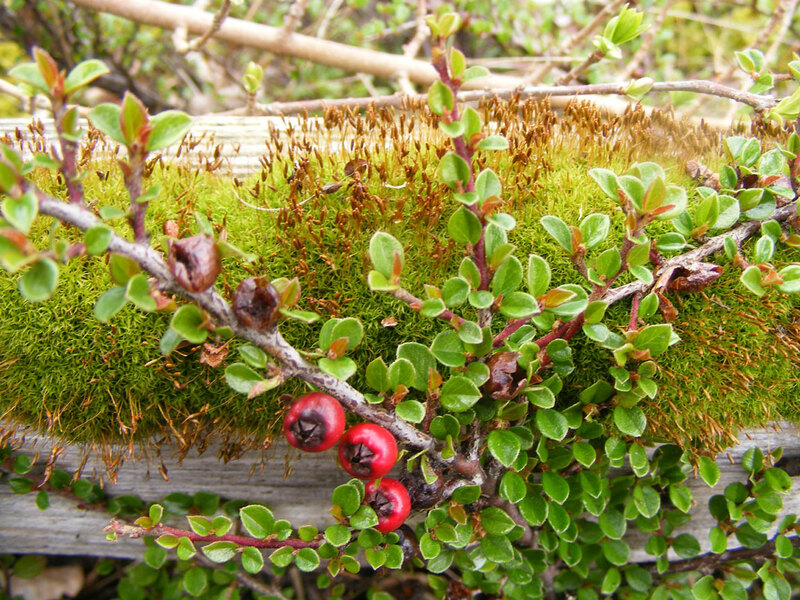 Red berries were still on the Wayfaring Tree, and on the Cotoneaster on the chalk cuttings, but only an occasional berry left on Hawthorn and Holly.